The aircraft will then be on static display July 13 to 15 for the Royal International Air Tattoo (RIAT) airshow being held at RAF Fairford. The flight and display will help commemorate the RAF’s centenary celebration (RAF100). MQ-9B is the latest evolution of GA-ASI’s multi-mission Predator B fleet. GA-ASI named its baseline MQ-9B aircraft SkyGuardian, and the maritime surveillance variant SeaGuardian. MQ-9B is a certifiable (STANAG 4671-compliant) version of the MQ-9 Predator B product line. The company explains its development is the result of a five-year, company-funded effort to deliver a RPA that can meet the airworthiness type-certification requirements of various military and civil authorities, including the UK Military Airworthiness Authority (MAA) and the U.S. FAA. GA-ASI explains type-certification, together with an extensively tested collision avoidance system, will allow unrestricted operations in all classes of civil airspace. Several important MQ-9B milestones were achieved in recent months, explains the company, including the first FAA-approved flight for a company-owned RPA through non-segregated civil airspace without a chase aircraft, and an endurance record of more than 48 hours of continuous flight. As part of the transatlantic flight, GA-ASI has partnered with Inmarsat, a provider of global mobile satellite communications (SATCOM) services. 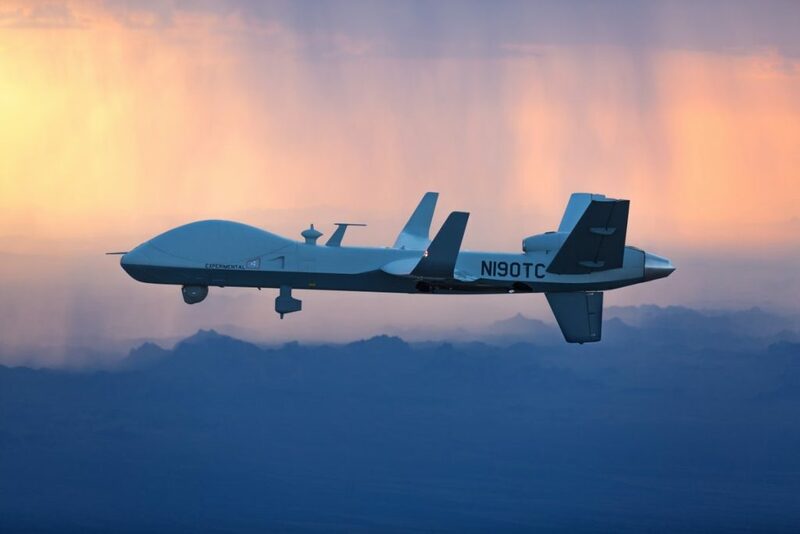 Inmarsat’s SwiftBroadband SATCOM will be used by the MQ-9B’s ground control station to communicate and control the aircraft and also will be used in the RPA’s final configuration for capabilities such as automatic takeoff and landing.